Using the mysql and nginx containers, running a migration yields the following error: The server requested authentication method unknown to the client [caching_sha2_password]. This seems to be due to mysql 8.x forcing a new password format. Attempting to force old_passwords=1 from inside the mysql container yields ERROR 1231 (42000): Variable 'old_passwords' can't be set to the value of '1'. This does occur when trying to run a migration from inside the workspace - where both the version of php and mysql should be controlled by Laradock. Laravel should be able to login to the database and do its thing. Pull clean copy of Laradock, set DB_HOST=127.0.0.1 in .env (for reasons unknown to me, DB_HOST=mysql yields SQLSTATE[HY000]  php_network_getaddresses: getaddrinfo failed: nodename nor servname provided, or not known), start the mysql and nginx containers, enter the workspace container and run php artisan migrate. 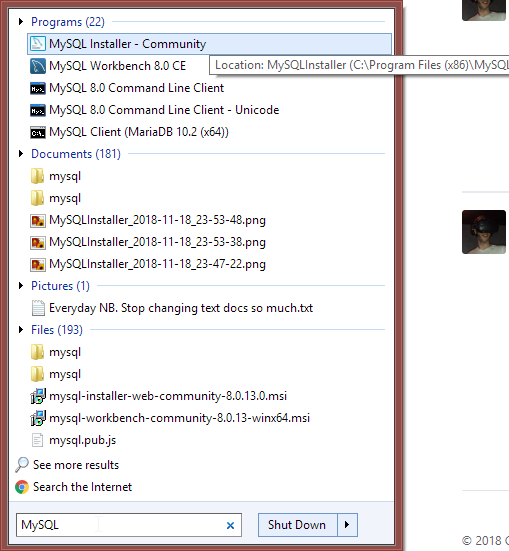 mysql works for me inside the .env file, but otherwise I'm experiencing the exact same problem. Additionally, I'm using PHP_VERSION=56 in laradock/.env (have an older 5.1 Laravel project I need to stand up and don't want to troubleshoot Valet issues with older version(s) of PHP. +1, I'm having the same problem here. Me too, same problem . important note: remove old user, database and recreate again by above script. 3. Remove mysql container and re-run it. Default authenticate of MySQL 8.0.4 changed. @rockerbom This worked for me after a long time of forensics. Also solved how to create a DB. @adammparker I tried your option and bring everything back to 5.7 but I was not able to bash into the container for some reason. @danaia I think I may have experienced something similar. Rather than debugging I just nuked all of my Docker settings, containers, and images and just started from scratch (with the older [and more stable] version of MySQL). Getting the same issue with php 7.1, any ideas on how to fix it for 7.1 without redoing all the Docker entrypoints? @wmellema are you instaill php-cli? could you share .env file? Have a stable solution after a few days banging thy head. MySQL 8.0 is not stable at all for me. I am surprised it is a part of Laradock. Does anyone know why a dev version is included VS a production version? Once I downgraded to 5.7 all errors above are gone and my head is healing. Like to suggest to the developers of Laradock to please use a stable version of MySQL so others may not need to travel the road of misery. Hi everyone, I think, always check config file new different after upgrade laradock is good practice. @adammparker I changed Mysql verision to 5.7 in .env, and rebuild it. I can run it, but its exit 2 when I use docker-compose ps, could you help me? @silsuer , agreed same issue occurred exit 6 to me thought! @silsuer I had the same issue. Then removed MYSQL_ROOT_USER since I realized an issue with Docker container for MySQL ...it already creates the root user as root. So when I removed it all worked fine. I am also hosting multiple projects and all is working well without extra patches. I'm NOT getting the error with mysql 8.0.0. This version might also be working. @MattBidas I'm NOT getting the error with v8.0.0. Just posting it as another possible solution. you can check by "docker inspect name_of_mysql_1" and then you can use IP of Gateway which is "172.18.0.1"
just info, im already done with it..
You should be able to login as 'root' or your other password. This should give you access in PMA. @francoism90 Perfect. Thanks a lot ! @francoism90, Thanks for your workaround! This worked. But does anyone know what the permanent solution is? 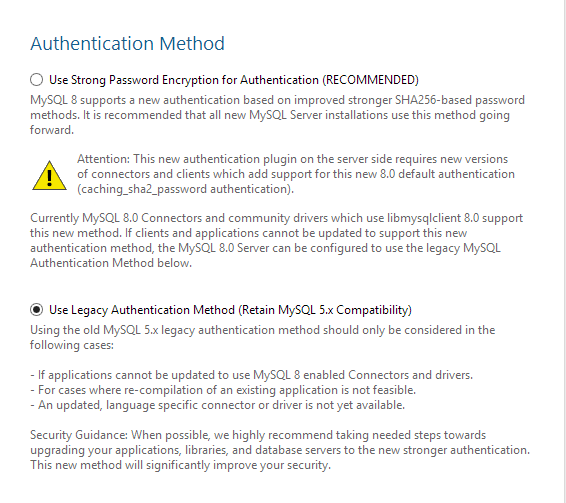 According to the PHP documentation, we should wait for a new version of mysqlnd: http://php.net/manual/en/mysqli.requirements.php to be able to use the new authentication method. @francoism90 its working, thanks a lot. alter user 'username'@'localhost' identified with mysql_native_password by 'password'; would fix it. Basic PDO user with a possible solution. You do not have to uninstall MySQL 8.x or even do the above (maybe... I'm not using Laradock). 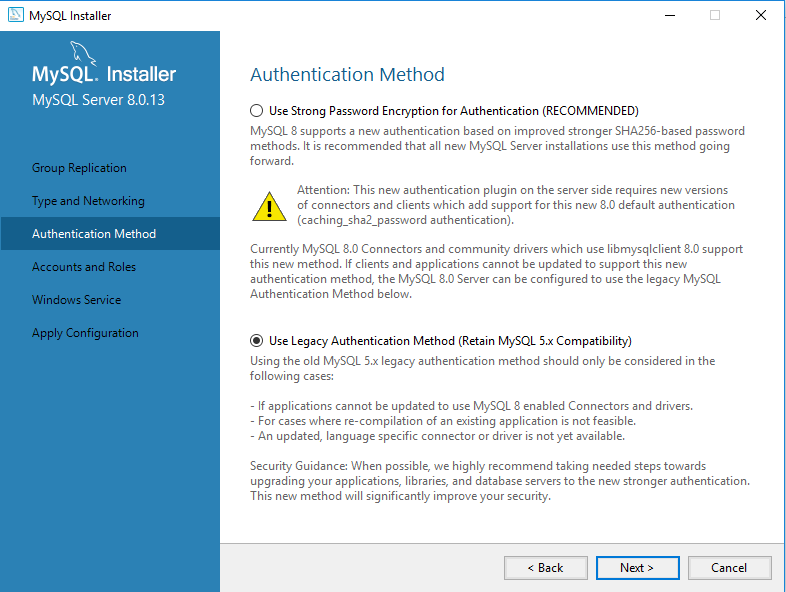 You just need to go to your MySQL installer, reconfigure your server, and select Legacy Authentication Method (which retains MySQL 5.x compatibility). I figured this out through trial and error after my dsn in my PDO didn't allow me to connect. 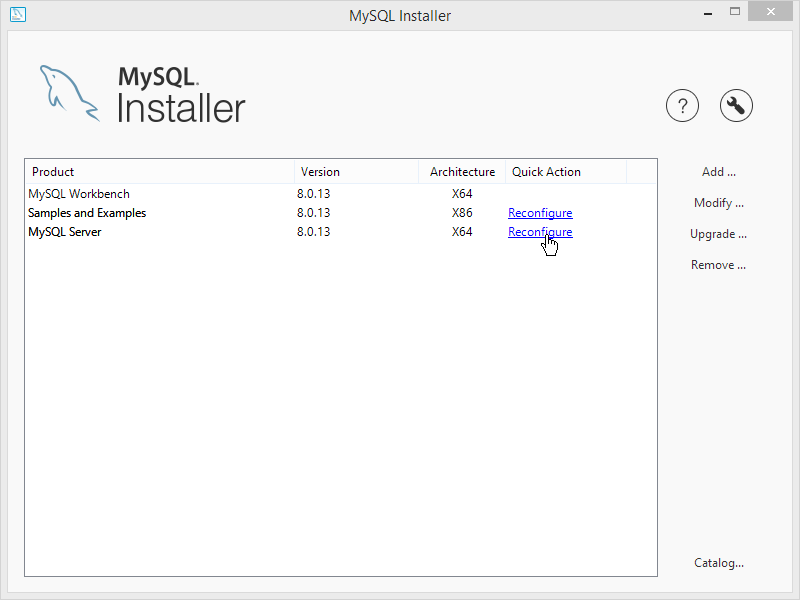 I solve with Mysql Installer. Just select the legacy authentication method. @fabionofre Thanks for the crystal clear solution. I applied solution from this video. This below query solved my problem. so apparently re-building the mysql image did the trick. Why isn't this set up by default?